Videos offer excellent opportunities to illustrate texts and enliven the pages. There are many cases, when information, like product introductions, testimonials, instructional materials etc., which look really great and are usable in video format. Write appropriate width, 635 pixels, into the field "Custom Width"
Copy the embed code "iframe width=..." from the text area. The illustration shows where you find "Share" button and "Embed" dialoque. "Embed" button is located under video screen. 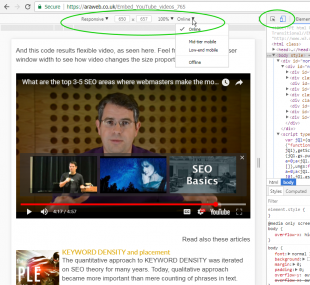 Click on "Embed" dialog, modify width of video and copy the code. Open the text editing dialogue and click the button "HTML". Insert the video code that you copied from YouTube, and save. Embedding videos is a great way to enliven your pages. A good thing about embedding videos, which are originally hosted in YouTube, is that even with increasing popularity you do not need to worry about possible limitations on your server disk space or bandwidth use. The major problem occurs, when you are looking website with smartphones or other smaller screens, which show narrower view, than the video width. That is why you need slightly modified version of embed code. And this code results flexible video, as seen here. Feel free to change browser window width to see how video changes the size proportionally. You may certainly open your website with some smartphone or tablet or smaller laptop, but the chance is, that you will not be able to see how your layout css responds to all different screen widths. Good way to emulate exact pixel wise screen widths on your desktop computer is to open "Mobile view" in your browser. All modern browsers have built-in functionalities for emulating small screens. In Mozilla Firefox, you need to use just shortcut Shift+Ctrl+M to open mobile view. In Google Crome, in is needed to open "Developers Tools" with Shift+Ctrl+I at first and then it is possible to open mobile view with shortcut Shift+Ctrl+M. On mobile view you have options to drag screen width easily on pixel wise or choose particular devices from dropdown list. There is also possible to switch from portrait mode to landscape mode to see how page layout changes if it is viewed in different modes without reloading the page. To insert YouTube videos to webpages, follow these steps: Go to the desired video page in YouTube and click "Share" button Open "Embed" dialogue for setting video size and format Write appropriate width, 635 pixels, into the field "Custom Width" Copy the embed code "iframe width= Videos offer excellent opportunities to illustrate texts and enliven the pages. There are many cases, when information, like product introductions, testimonials, instructional materials etc., which look really great and are usable in video format.